In our first year at Pinfold cottage we were rather suprised by the emergence of one particular plant. In February last year appeared what resembled giant boils on the southern bank of the garden stream. These rapidly opened up and transform into baby cauliflower-like flowers (see picture), attracting early woodland insects. 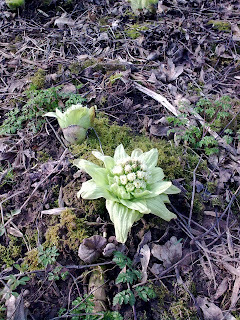 These we soon learnt were the forerunners of the even bigger leaf parts of Giant Butterbur (Petasites japonicus). As the latin name implies, these plants originate from Japan, being introduced to Great Britain. They have since become naturailsed, preferring damp places on roads and riversides, characterised by there huge leaves up to 1 metre across. The banks of our woodland garden are therefore ideal for this plant to proliferate and so did require some management last year. In their native country the flowers are prized for their flavouring to miso soup and soy sauce, whilst the flowering stems can be eaten cooked(1). The leaf stalks can also be boiled and eaten like rhubarb; hence its other common name, Bog Rhubarb (1). 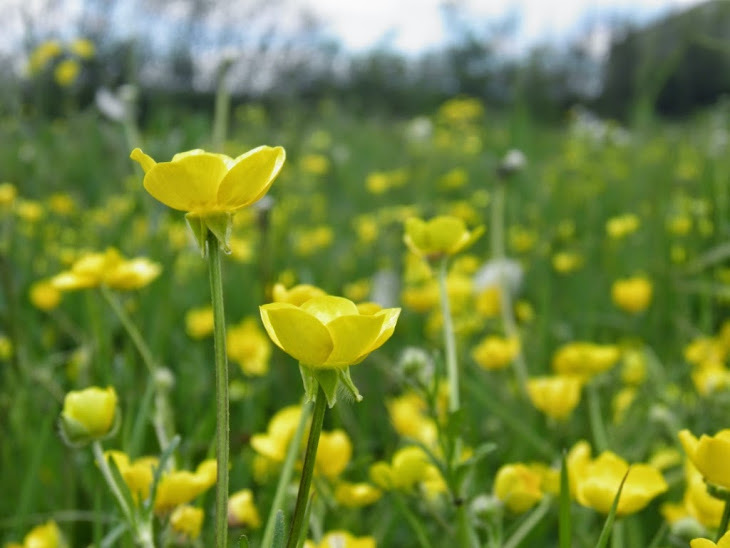 It has also been used as a traditional medicine for a number of conditions going back to the Middle Ages for the plague, and more recently for migraine (2), having been the subject of clinical trials. But be careful before you try any self-remedies as the extraction of active ingredients (mainly from the roots) is complex. Other uses include using the large leaves as an umbrella (hence its name from the Greek word for a large brimmed hat, the Petasos) or wrapping up butter (before the days of refrigeration), and the leaf stalks as walking sticks.